Did he land a whopper, or is he just telling another of his whopper stories! 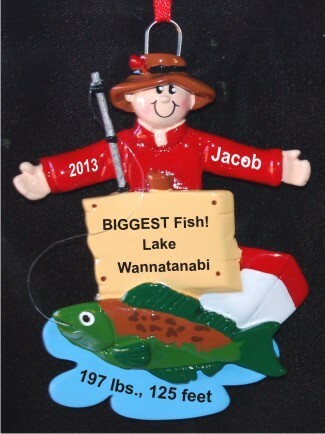 Have fun with your favorite fisherman with the BIGGEST fish, best fish story personalized Christmas ornament. It features a friendly angler telling a story of the one that got away or showing off his prized catch. These hobby ornaments personalized just for him include the details you provide. An artist will paint them on by hand, though in a handsome font that creates a customized look he'll enjoy. Commemorate that whopper - whether real or imagined - with the fisherman big fish personalized Christmas ornament that will put a smile on his face when he receives it in our classic velvet drawstring bag. Christmas ornament for grandson Dec 29, 2015 Joann K.